Rowena has been CEO of Manchester Science Partnerships (MSP) since 2012. MSP is a public private partnership, with the University as a founding member, established to deliver the primary goal of the city’s post-industrial strategy – to grow a new knowledge economy. Since becoming CEO of MSP, Rowena has been responsible for, among other things, doubling the physical footprint of Manchester Science Partnerships on the Oxford Road Corridor, including the multi-award winning Citylabs and recently completed Bright Building. She led on the strategy for acquiring and re-positioning Alderley Park from Astra Zeneca in 2014, safe guarding the future of a key scientific asset and establishing the vision for it to be a diverse Open Innovation Bio Science Campus. Rowena is a great friend and partner of the University, acting in many ways, including as an ambassador and supporter of the Stoller Biomarker Discovery Centre and the Connected Health Cities programme, and as a partner and collaborator in many strategic bids for projects to strengthen the City region’s science infrastructure. More recently, as a founder partner and now Executive Chair of Health Innovation Manchester, Rowena has been instrumental in securing Qiagen’s investment in Manchester which will bring a new world-leading precision medicine campus to the Corridor Manchester Enterprise Zone, located on the UK’s largest clinical academic campus - Manchester University NHS Foundation Trust. ​Rowena is also active on several other boards and involved in many other initiatives. Clive was until very recently CEO of UMI3 Ltd (The University of Manchester’s Inspire, Invent, Innovate Ltd). Clive co-founded, and was at the helm of, one of the UK’s earliest formed university commercialisation companies (UMIST Ventures Limited), which was established in 1988. He led and evolved UMI3 since its formation in 2004 to become one of Europe’s leading university technology transfer organisations. Over the years Clive has been active in numerous successful commercial transactions; presented at key international spin-out and licensing conferences; acted as an expert contributor on university IP to national committees and inquiries; and been a board and committee member of relevant professional networks and associations such as the British Venture Capital Association. A Fellow of the Institute of Directors and of the Chartered Institute of Marketing, Clive received the Italian Order of Merit for services in promoting Manchester’s business relations with Italy. Clive is now the University’s Associate Vice-President for Intellectual Property (IP) Matters. 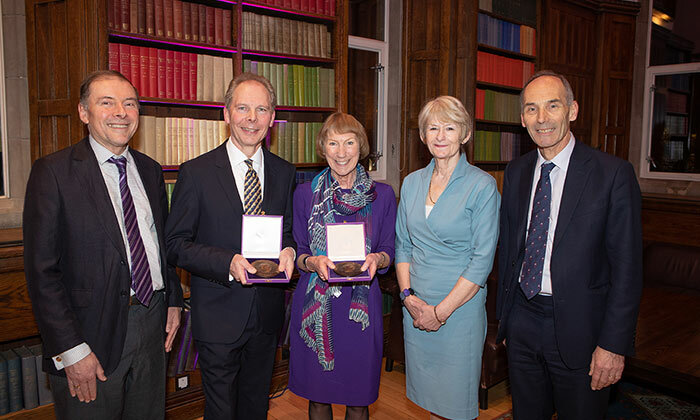 The Chairman of the Board of Governors, Mr Edward Astle, conferred the Medals on Rowena and Clive.